Going on Vacation? Your Garden Doesn't Have to Suffer. | Faddegon's Nursery, Inc. Going on Vacation? Your Garden Doesn’t Have to Suffer. Vacationing without your plants? I’ll assume you answered yes to that. But how do you take care of them while you’re gone? You’ll need a plan for leaving your plants on their own for a week or two if you don’t have a friend or neighbor to pitch in. Before leaving on your vacation check the weather not only for your destination but for your home base. If rain is in the forecast often enough while you’re away (1-2 inches a week), you’ll likely have nothing to fear but if very little rain is on its way there are strategies to consider. Most of us have mulch in our flower beds or around trees or shrubs. If you have a nice thick layer, give it a good soaking before you leave. This will help keep moisture in the ground as long as possible. If your mulch layer is thin or non-existent, you might want to put down a 2-3 inch layer. Built-in irrigation systems have timers but you can turn any hose or sprinkler into a garden helper. Just pick up a timer and attach to your outdoor faucet. This is particularly helpful if you have edibles growing. Wind a soaker hose through the rows and attach to the timer. If you are really against being bothered with hoses and timers, you can thoroughly water several times in the days leading up to your departure. Flowers and plants in containers should be moved into the shade together and given a very thorough watering. Full sun containers will benefit from this as well. 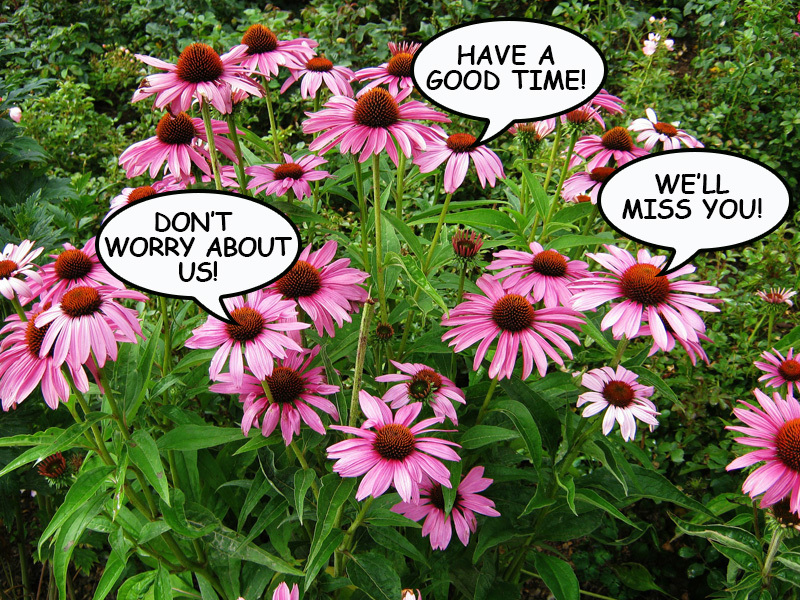 Better to have fewer flowers blooming while you’re away than to let the planting go dry. All manner of empty containers such as plastic milk containers or 2-liter soda bottles can be used to make watering contraptions. Just poke a few small holes in the container after filling, set it down next to the plant and let it slowly leak into the ground. As long as you’re watering, use a liquid fertilizer to give those plants a nutritional boost to see them through. Since you won’t be home to chase rabbits, deer, or groundhogs yourself, use Repels-All (it’s all natural) around the garden. It will do a good job of keeping critters away while you’re away. You may already have chicken wire around edibles but if not, this would be a good time to put some up. You may also want to make small circles of chicken wire that go around any flowering plants that critters tend to like. Harvest anything that will come ripe during your absence. Snip off some sprigs of herbs so they don’t go into flower which will reduce leaf production. Deadhead flowers that you know will pass while you’re gone so you don’t come back to dead or melted flowers on your plant. Nobody wants to come home to a yard full of weeds and we know how fast they can grow at this time of year. Do a thorough weeding before you leave so you aren’t overwhelmed upon arrival home.